Wellington, FL – January 24, 2013 – Renowned show jumper Katie Monahan-Prudent guided Michael Smith’s V to victory in Thursday’s $33,000 Ruby et Violette WEF Challenge Cup Round 3 during the third week of competition at the 2013 FTI Consulting Winter Equestrian Festival (FTI WEF). Competing in the International Arena at the beautiful Palm Beach International Equestrian Center (PBIEC), the seasoned veteran topped young U.S. competitors Kristen Vanderveen (23) aboard Bull Run’s Eternal and Lauren Tibso aboard Tequestrian Farms’ Roundthorn Madios (28) who finished second and third respectively. Week three of the FTI WEF runs January 23-27. The week will feature the FTI Consulting Great Charity Challenge (FTI GCC), presented by Fidelity Investments, at 7 p.m. on Saturday evening. This year, the event will distribute $1.5 million to 34 lucky Palm Beach County charities in a pro-am team competition. Other highlights will include the $25,000 Suncast 1.50m Championship Jumper Classic at 1 p.m. on Saturday. The grass derby field at The Stadium at PBIEC will host the $50,000 CSI 2* Grand Prix, weather permitting, at 2 p.m. on Sunday. The 2013 FTI WEF circuit continues through March 31 featuring 12 weeks of world-class competition. The course designer in the International Arena for week three competition is Uliano Vezzani of Italy. In Thursday’s $33,000 Ruby et Violette WEF Challenge Cup Round 3, Vezzani saw 58 competitors with 13 advancing to the jump-off. Over the short course, only five riders were able to clear the track without fault. Katie Monahan-Prudent and V, an 11-year-old KWPN gelding by Landstreicher x Lennard, raced through the course in 34.99 seconds for the win. Kristen Vanderveen (USA) and Bull Run’s Eternal finished in 35.36 seconds for the second place prize. Lauren Tisbo (USA) and Roundthorn Madios stopped the clock in 35.86 seconds to place third. Great Britain’s Tim Gredley and Unex Omega Star, owned by Unex Competition Yard, were fourth in 35.87 seconds, and Fernando Cardenas (USA) and Quincy Car placed fifth in 36.01 seconds. Peter Wylde (USA) and The Wannahave Group’s Sandor de la Pomme had the fastest round of the day in 33.32 seconds, but a rail at the last fence put them into sixth place. Monahan-Prudent has had V for a year and a half and has formed a great partnership with the gelding. The pair also won the $8,000 G&C Farm 1.45m jump-off class during week two of the FTI WEF and will continue on this week in the $50,000 CSI 2* Grand Prix on Sunday. 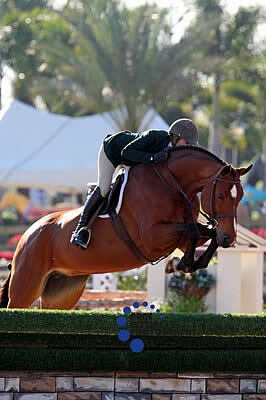 Monahan-Prudent has a busy schedule teaching many top riders such as young Olympian Reed Kessler. She has had a lot of wins in her career and now focuses a lot on her students, but admits that is always nice to get a win for herself. It will be a busy circuit for the next nine weeks in Wellington and then on to the rest of the season. As far as plans for showing this year, Monahan-Prudent goes where her students go. Kessler was also in the jump-off with her horse Onisha in Thursday’s class and although they like to compete, the student and her teacher always cheer each other on. Along with the prize money for Thursday’s class, a $6,000 rider bonus for the SSG “Go Clean for the Green” contest was also up for grabs as last week’s winners did not have SSG ‘Digital’ gloves, but Monahan-Prudent was unfortunately missing one of her gloves for today’s class. The bonus has not been won in two weeks now, so $9,000 in bonus money will be offered next week in the $33,000 Ruby et Violette WEF Challenge Cup Round 4. The bonus goes to the winning rider if they are wearing the SSG ‘Digital’ Riding Gloves in all rounds of competition with the SSG logo clearly visible. Sons Souci and Havens Schatt earned championship honors in the Equine Tack & Nutritionals First Year Green Hunter division during week three of the FTI Consulting Winter Equestrian Festival (FTI WEF). This will be the third week one of Schatt’s mounts has collected championship titles. 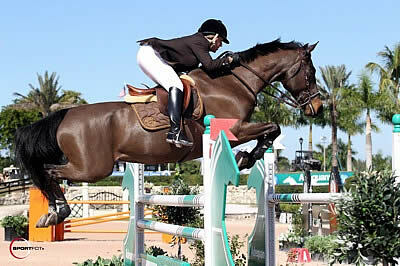 Caroline Moran’s Bacardi, ridden and trained by Schatt, has been division champion weeks one and two at the FTI WEF. Schatt and Sons Souci, a ten-year-old Warmblood mare owned by CH Farm LLC, earned high scores over two days of competition both over fences and under saddle. The pair was second and seventh over fences and second under saddle on day one, followed by first and third places over fences on day two of competition for the division. Reserve champion of the division was Mythical, ridden by Kelley Farmer and owned by David Glefke and Dr. and Mrs. Kenneth Garber. Farmer and Mythical were first and third over fences day one before placing second in the over fences stake round on day two. The FTI WEF marks Sons Souci’s first season competing in the First Year Green division, but Schatt feels she is settling in nicely. “I did [First Years] week one [of the FTI WEF] and she was jumping the top of the standards! So we went home and did a little practicing. Yesterday, in the Green Conformation I did for practice, she was still a little leery of what was going on. And then she was second and seventh, but seventh with an 85, yesterday and today [scored] 88 and 89 right from the beginning. She was super,” Schatt stated. “She’s such a good horse. She goes in the ring and she tries every time to do what’s right. Sometimes she over-tries, but she always tries to do what’s right,” Schatt continued. Although geldings are usually favored for having a more even-keeled temperament than their female counterparts, Schatt has nothing but praise for her sweet mare’s disposition. “My program is we take our time with horses. For me, I deal with her just like I would deal with a gelding. She’s not mean to the other horses, she’s just really sweet,” Schatt stated. “I think some people would call her more sensitive, but she’s not really. You get on, and she gives you that feeling like ‘I can’t move, I can’t do anything.’ But if you take her mouth and put your legs on, in two minutes she’ll do whatever you want. She rides amazing and she’s really well broke,” Schatt continued. Schatt also loves the sensitivity that Sons Souci’s has and the extra blood that helps make her a better jumper. “A lot of people might think [she’s got] a little too much blood for a hunter, but I really like it. She jumps like these jumps are nothing and she’s got so much scope,” Schatt stated. Week three of hunter competition at the FTI WEF continues Friday with the Adult Amateur 18-35 Hunters in the Rost Arena. The RCG High Amateur-Owner Jumpers will be featured in the International Arena. For full results, go to www.showgroundslive.com.